Gerald Rudolph Ford Jr., who became the 38th president of the United States as a result of some of the most extraordinary events in American history and sought to restore the nation's confidence in the basic institutions of government, died Tuesday. His wife, Betty, reported the death in a statement. "My family joins me in sharing the difficult news that Gerald Ford, our beloved husband, father, grandfather and great grandfather has passed away at 93 years of age," Mrs. Ford said in a brief statement issued from her husband's office in Rancho Mirage, Calif., the Associated Press reported. "His life was filled with love of God, his family and his country." "Laura and I are greatly saddened by the passing of former President Gerald R. Ford. President Ford was a great American who gave many years of dedicated service to our country. On August 9, 1974, after a long career in the House of Representatives and service as Vice President, he assumed the Presidency in an hour of national turmoil and division. With his quiet integrity, common sense, and kind instincts, President Ford helped heal our land and restore public confidence in the Presidency. The American people will always admire Gerald Ford’s devotion to duty, his personal character, and the honorable conduct of his administration. We mourn the loss of such a leader, and our 38th President will always have a special place in our Nation’s memory. On behalf of all Americans, Laura and I offer our deepest sympathies to Betty Ford and all of President Ford’s family. Our thoughts and prayers will be with them in the hours and days ahead." Ford was the only occupant of the White House never elected either to the presidency or the vice presidency. A former Republican congressman from Grand Rapids, Mich., he always claimed that his highest ambition was to be speaker of the House of Representatives. He had declined opportunities to run for the Senate and for governor of Michigan. He was sworn in as president on Aug. 9, 1974, when Richard M. Nixon resigned as a result of the Watergate scandal. "The long national nightmare is over," Ford said in his inaugural address. "I believe that truth is the glue that holds government together, not only our government, but civilization itself. That bond, though strained, is unbroken at home and abroad." 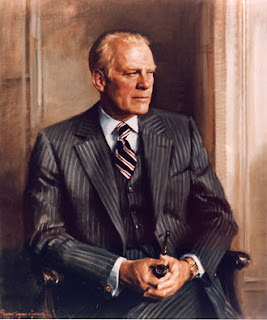 President Ford was the only president I've ever seen in real life. He was at the Tulip Festival Parade in Holland, Michigan, in the 70s (probably 1976). I was a school bus driver then, and had driven the Brighton HS Marching Band there to march in the parade. I had gone to Hope College (in Holland) for a year and a half a couple of years earlier, and was used to the "usual" mass of traffic for the parade, but this was something different. My rudimentary knowledge of the town (I didn't drive when I was at school) was somewhat overwhelmed by the huge crush of traffic and security. I was supposed to be leading the other buses, due to my "experience," and wasn't doing too well - but we all made it through safely and got to see the parade. Condolences to his family and friends - Rest in peace, President Ford. UPDATE: Captain's Quarters blog has a piece on Ford, with some links. UPDATE: The official President Ford memorial site. UPDATE: Registration req'd - President Ford at the NY Times.